Elbow Pain? We Can Help! Niggling pain in your elbow? Do lots of heavy manual work or gym junkie? Elbow pain is a very common complaint across the population, from extremely active sportspeople to desk workers. 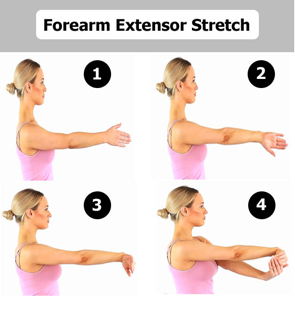 Extensor tendinopathy or Tennis Elbow as it is commonly known may be the cause of your pain. Tennis elbow is a repetitive strain injury affecting the point of where the tendons of your forearm attach at the elbow. This results in pain to the outside of your elbow made worse by gripping and lifting activities. It is referred to as tennis elbow as a high proportion of tennis players will suffer this problem however it can be caused by manual work or dexterous tasks such as typing for example. If caught early tennis elbow can be resolved with physiotherapy treatment very effectively. However if ignored can become a difficult and chronic problem. Get it fixed, Get is sorted! To learn more about shoulder exercises, please contact Hinterland Physio on ph. 4972 5155, or request an appt at: http://www.hinterlandphysiotherapy.com.au/private-services/request-an-appointment/.